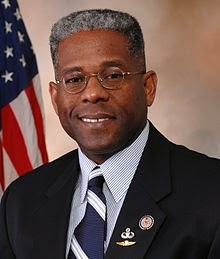 Allen West is a retired Lieutenant Colonel and the former Representative from Florida’s 22nd district. West is a Teabagger, and is often mentioned by other Teabaggers to deflect accusations of racism in the movement (West himself claims that racism in the Tea Party movement is a conspiracy invented by liberal media). He was elected in the Teabagger wave of 2010 but was defeated in his 2012 reelection bid, perhaps partially because people realized he was more or less clinically insane (though that should have been pretty damn obvious the first time around as well). His 2010 campaign went over well with certain segments of wingnuts, however, and he did get the Sarah Palin stamp of approval early on. Also, Glenn Beck praised West for his service in Iraq, which ended (Beck didn’t mention) when West and his gang beat an Iraqi detainee senseless and used the information the detainee provided to arrest another, entirely innocent person, whereupon West was found in violation of the Uniform Code of Military Justice, relieved of his post, and fined $5,000. Perhaps the most famous incident of his 2010 campaign occurred when a reporter asked West about the IRS lien placed on him. West responded by saying that the IRS document was “faked”, and that he could document this. After he promptly failed to produce said documentation, he invented the interesting logical fallacy of “appeal to security clearance” to try to escape the “gotcha” questions, which consisted of claiming that he had an even higher security clearing than the president, therefore shut up. Christine O’Donnell also tried to invoke that one at one point, by the way. Otherwise, West’s campaigns seem primarily based on relatively familiar stuff. For instance, House Democrats are communists. Indeed, there are “between 78 and 81” Democrats in Congress who are members of the communist party, according to West, who failed to provide any references or indication of how he arrived at the numbers (well, in one sense he indicated it pretty clearly). He also diligently uncovered a “Soviet Union, Marxist-Socialist” meaning in the Obama campaign’s “forward” slogan. So there is plenty of conspiracy going on. Indeed, since West refuses to believe that Obama could achieve anything, when e.g. statistics showed a drop in unemployment rates, West was quick to dismiss it as a conspiracy: “This is Orwellian to say the least and representative of Saul Alinsky tactics from the book ‘Rules for Radicals’ – a must read for all who want to know how the left strategize.” (No, he didn’t address the numbers themselves.) He has also compared Food Stamps to slavery, and, with dizzying lack of self-awareness, accused Obama of demagoguery – and for being a “disgusting racist” who “despises” white people. An equally impressive degree of self-awareness can be found in his assertion that “the Left tries to win the women's vote by talking from the waist down” – Democrats want the government to be the “sugar daddy” and replace men – while Republicans seek to reach the hearts and minds of female voters. Meanwhile Chuck Hagel is a “traitor” who dutifully serves “Barack Obama’s game plan to weaken the United States of America” – Obama wants to weaken the US ostensibly because he only cares about people on welfare (yeah, that’s the “reasoning”; such is the mind of Allen West). Then there is Benghazi. According to West, the media’s focus on the Boko Haram group in Nigeria in Spring 2014 was part of the Obama administration’s efforts to draw focus away from Benghazi. “Are we witnessing an Obama ‘Wag the Dog’ moment with Boko Haram in Nigeria? I say yes,” said West. When Ahmed Abu Khattala, the accused perpetrator of the Benghazi attack, was captured just a few weeks later, West promptly tweeted that the capture was just a way for the Obama administration to distract from non-Benghazi scandals. In the meantime, he had also claimed to have gotten the horrible “truth” about Benghazi from a random, unnamed stranger seated next to him on a plane (Kent Hovind’s main source of scientific “information”), but he didn’t tell us what it might be, only that it was really shocking. He also claimed that African American Democrats are trying to keep African Americans “on the plantation,” while casting himself as the “modern-day Harriet Tubman” ferrying them to rescue. In a critical summation of West’s style, Mother Jones aptly concluded that for West “every sentence is a proxy war in the larger struggle between patriots and the ‘people in this world that just have to have their butts kicked.’” You can probably guess his reaction to a 2013 admission by the IRS that it had particularly scrutinized tea party groups (a conspiracy spearheaded by Obama in person). It is, to put it mildly, not the only time West has endorsed whale.to-level conspiracy theories. When he lost his seat in the 2012 general election (which included at least one incident of threats and harassment), the reason was that he was cheated out of it (he seems, indeed, to genuinely believe this), and when he finally conceded defeat (“[w]hile many questions remain unanswered”), he promptly struck a (delusional) martyr pose. Some other lunatics of the House, including Paul Broun and Louie Gohmert, nevertheless endorsed him for Speaker, despite the fact that he no longer helda seat (which is rather illuminating). In his political career West’s main achievement seems to have been being a keynote speaker at CPAC 2011, where he ranted more or less incoherently about the Civil War, Nazism and Obama – said political career seems to have been somewhat inhibited by the fact that West clearly has no idea how our system of government works (e.g. when he rejected Obamacare as “not the law of the land” but an “edict” that shows that President Obama is establishing a monarchy). He was, for instance, shocked to learn that Muslims, for instance, were allowed to vote in the US. He has threatened to run again in 2016, though. West’s memoirs, Guardian of the Republic, are most notable for its range of fake Founding Father quotes. Diagnosis: A moronic clown. But when such clowns are given power and influence, like West, they stop being particularly funny. I'm sure the Iraqis he tortured didn't find him funny AT ALL. Allen West is an excellent pick. Diana West (no relation to Allen) is also an excellent candidate for this blog, although she has given up the paranoid rambling she calls a column.